RE/MAX Galway presents to the market a newly built four/five bedroom dormer bungalow located in Brean Drim, Cong, Co Mayo. 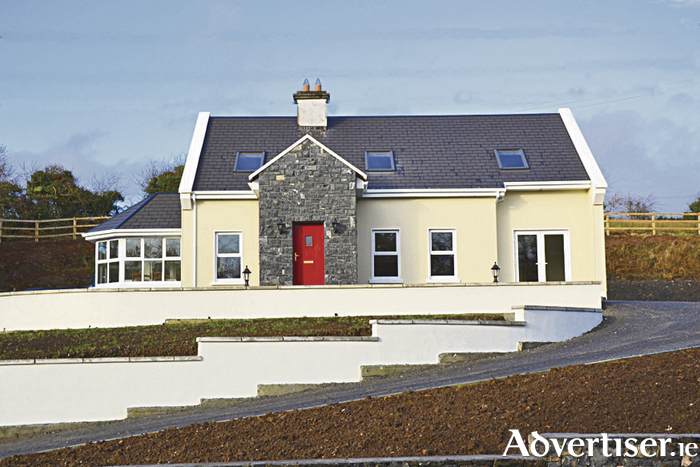 This superb home is situated on the main Cong to Clonbur road on an elevated and private site. It is extends to over 2,200sq ft and is in excellent condition. The living accommodation of the ground floor comprises an entrance hall, living room, kitchen, sun room/dining area, utility, downstairs wc, en suite bedroom, and office/study/bedroom. On the first floor is a landing, main bathroom, and three bedrooms, one of which is en suite. The property boasts a B3 BER, is heated by ofch, and features two solid fuel fireplaces. A stunning driveway and garden surrounds the property with ample parking space. The lawns are to be completed at the earliest convenience, weather permitting. There is a large garage to the front with front access, having the convenience of space for a car and boat trailer. This garage will have double wooden garage doors and be stone faced, as will the front boundary walls once completed. The driveway features lights and stone walls which lead you to the elevated site. This is an excellent property, suitable as a family home, country getaway, or as a fisherman’s paradise. You can enjoy the beauty of the nearby mountains and lakes, yet are close to all the amenities available locally. For more information contact Martin Healy of RE/MAX on 091 330 300. AMV is €280,000.